Make a soft dough of all the ingredients except oil/ghee. Leave for 5 minutes and knead again. Make medium sized balls and roll into thick parathas either square or round ones. Cook on hot tava with little oil/ghee till brown spots appear on both sides. Serve hot with some curds and pickle. Dry roast the broken corn just until its hot. Heat oil, add the mustard seeds, bengalgram dal and blackgram dal. When it splutters, add green chillies, curry leaves and onions. Fry for 2 minutes. If you are adding vegetables, add at this stage. Then add water, salt and allow it to come to a boil. Stir in the corn and when it gets thick, transfer to a vessel and pressure cook for 2-3 minutes. Garnish with coriander leaves and serve with chutney/sambar of your choice. 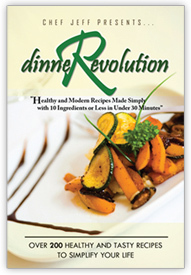 Now for the E-book..Chef Jeff has come up with a e-book DinneRevolution. The book is to be shortly released for a price of $27 and he is presently giving it away to the readers of Simple Indian food blog for FREE.. thanks Chef for the wonderful thought. There are more than 200 family dinner ideas in the e-book and also easy to prepare with less than 10 minutes involving just 30 minutes..
Keep everything ready before hand. Just before serving, mix all of them and serve immediately. Delicious and healthy snack for any time of the day. Mix all ingredients except oil. Add little water as required to make a batter not too thin and not too thick. Heat the tava and pour a ladle full of batter and spread it into a dosa. Add a few drops of oil and turn around when one side starts getting brown. Serve hot with chutney/sambar. Heat oil, add mustard seeds, blackgram dal, bengalgram dal and when it splutters add the curry leaves. Add sprouted and cooked horsegram, salt as per taste and mix well. Finally add the curry leaves and mix. Serve as an evening snack. Heat oil and add mustard seeds, bengalgram dal and blackgram dal. When it splutters, put in the curry leaves and add it to the batter. Add ginger paste, chopped onions and coriander leaves. Mix well. Heat the paniyaram pan and put it some drops of oil in each hole. Pour batter in the holes and cook on medium flame. When it starts getting brown, turn it over and cook on other side as well. Meet Uma from Uma's Kitchen Experiments in the Budding blogger series.. I am Uma from Uma's Kitchen Experiments, an experimenter for 2 months old blog and a software engineer by profession. Recently I tookover the role-incharge for my kitchen after marriage. Like many of you, I didn't know to cook much and all I knew was to cook something to eat for surviving when my mom wasn't available. Those days eating was my passion rather than cooking. Then, the day has come to cook for myself when I moved away from my home. I started very badly but after with the help of my mom, mom-in-law and granny, I learnt new recipes which are highly inclined towards South Indian Cuisine. I have also experimented few western recipes from my international recipe collections which I got from my visit to various other contries. When I was reading throuh few cooking articles on the web, the idea of blogging struck me. Instead of just cooking, why not describe the method behind cooking in a blog, so that it is useful for other amateurs like me. Thus my blog was born. As I am new to the blogging world I thought of starting it with my mom and mom-in-law's recipe collection. So you can find more authentic South indian recipes and few western style recipes from my blog. Visit my blog. Record your feedback to improve my culinary skills. I stumbled here from Indiblog and I was surprised to see my co-bloggers. Thank You EC for budding bloggers concept. The recipe is a take off from the Madurai famous street food Chilli Parota..The key ingredient - Kerala parota is replaced by bread. Cut the bread slices into pieces by hand or using a knife. Heat oil, add the onions and capsicum and fry for 2-3 minutes. Add the coriander leaves, tomato sauce, garam masala powder, red chilli powder, salt (the bread already has salt-so very little) and ajinomoto. Mix well and finally add the bread pieces. Mix well and serve hot with onion raita. The recipe in her words.. I would sincerely like to thank my dearest friend Mrs. Geetha Radha Krishnan for giving me this recipe. Soak all the ingredients for about 4 hrs and grind well to Dosa consistency. Add enough salt. 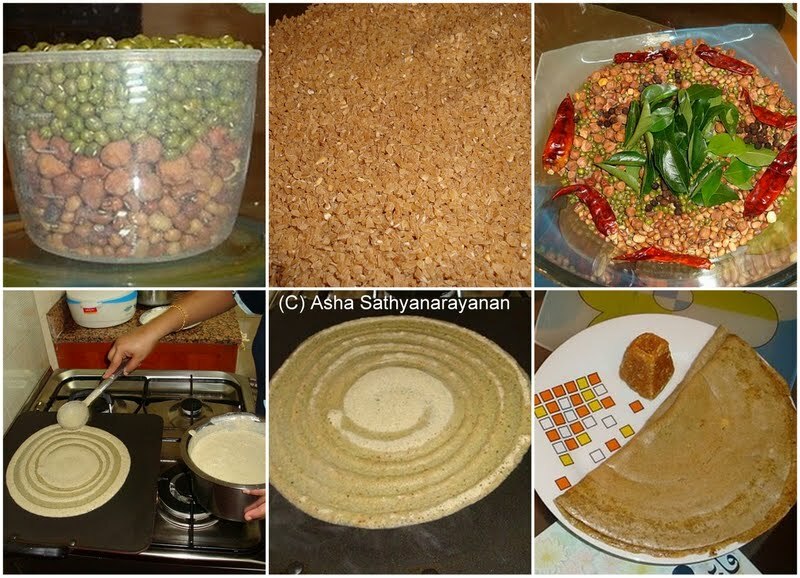 This Adai can be prepared immediately without fermentation. Heat a non-stick tava and pour the batter. Spread into medium thickness adai. Turn and roast both the sides. I have always made this Adai without oil at all. Turned out very good. Serve hot with Sambhar, Idly Molagai podi or onion chutney. You can also make chutney without coconut. Absolutely an excellent dish for Diabetics and weight watchers. Try this out and write to me. Soak the dals togethers for 2 hours. Grind the dals and soaked bran rice together to get a coarse batter. Let it be a thick batter and dont add much water while grinding. Add curry leaves and asafoetida tempered in hot oil and salt. Mix well. Heat tava and pour a ladle full of batter and make an adai of medium thickness. Add some oil in the sides and cook till golden brown. Flip and cook on other side for a minute. Grind the blackgram dal (urad dal) coarsely without adding water. Add salt, pepper and 2 tbsp hot oil and mix well. Grease a plastic sheet with a drop of oil. Make small balls of the dough and flatten them with your palms. Make a small hole in the center. Slowly drop them in hot oil and fry in medium heat till golden brown on both sides. Cool and serve. Dissolve the jaggery in the water and add the rest of the ingredients. Mix well.. Recipe source: Gayathri's version of bakery biscuits..
Sieve the sugar and flour together to remove any lumps. Divide into two parts. To one part add the vanilla essence and mix well. Add half the quantity of vanaspati little by little and keep mixing till you get a dough. For the remaining half flour portion, add the cocoa/ drinking chocolate powder and make a dough with the remaining vanaspati. Pack both these dough in a plastic sheet and freeze for 10 minutes. Dust the dough with little flour and roll into thick rotis. Place one above the other and roll slightly so that both of them stick to each other. Cut into desired shapes. Preheat oven to 180 deg. Arrange the biscuits leaving some gap between each biscuit. Bake in convention mode for 8 mins. Cool for 10 minutes before storing in an air tight container. As with most food bloggers out there, I too love eating and cooking dfferent varieties of food, primarily vegetarian and egg free , at home. Blessed with a foodie husband wasnt easy to manage, and although I have been cooking at home almost since high school , knowing about different culinary adaptations and flavours has been an interesting learning curve. My blog - "Itsnotmadrasi" is named so to (to quote from my "About me" page on the blog) " is to record interesting (which can also mean basic) recipes for all of us to read and share based out of South India. And just to educate all those on the culinary sensitivities and differences in not just plate (cutlery style oscillating from 'so-thought' melamine to stainless steel pathram , etc) but also in palate.So depending on what ingredients were locally grown to seasonal veggies, the recipes were developed. With distances shrinking and migratory patterns of humans increasing in area to cross-community / religion marriages, recipes have evolved" Afterall, not all people south of the Vindhyas are Madrasis :-) I am basically from Bangalore but settled down in Mumbai over the past decade.